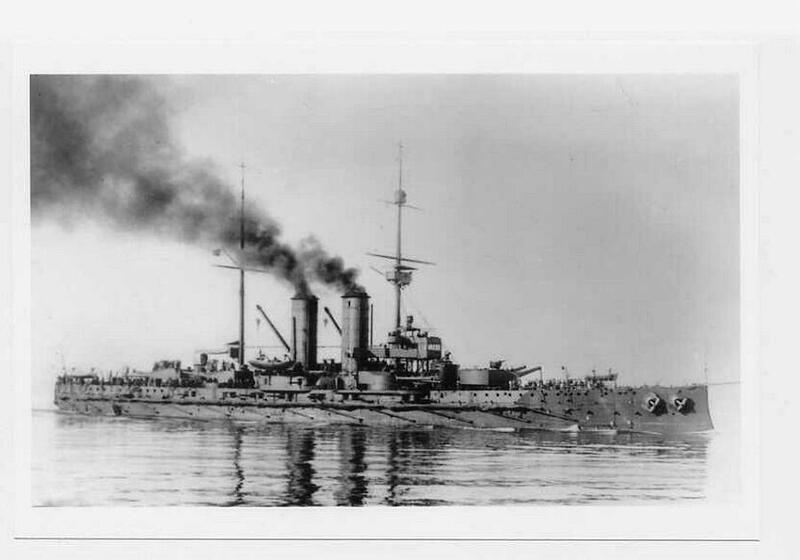 Apart from one major fleet sortie on the declaration of war between Austria and Italy on the 23rd May 1915, and an aborted one in June 1918 when dreadnought 'Szent Istvan' was lost, the Austrian heavy ships spent the entire war as a fleet-in-being within the Adriatic Sea, holding down a large portion of the Italian and French battle fleets as well as units of the Royal Navy. Most of the action in the Adriatic that took place involved the well-handled destroyers, submarines and to a lesser extent light cruisers of the Austrian Navy. VIRIBUS UNITIS ('with joined forces'), 1st November 1918, northern Adriatic Sea at Pola (Pula) naval base (c 44-45’N, 13-45’E) - Italian 'Mignata' (or leech) self-propelled mines. With the fall of the Austro-Hungarian Empire, the state of Yugoslavia was formed by the southern Slavs and declared on the side of the Allies. 'Viribus Unitis' (Capt Janko Vukovic de Podkapelski, also provisional Yugoslav Fleet commander) was taken over on the 31st October by the Yugoslav National Council as flagship of the new navy. Apparently ignoring the new political situation, the Italians went ahead with a planned attack on Pola. Early in the morning of the 1st November and with few defensive precautions now being taken, two Italian frogmen, Maj of Naval Engineers Raffaele Rossetti and Doctor Lt Raffaele Paolucci, slipped into the naval base and attached mines to the dreadnought and liner 'Wien'. Both ships sank, 'Viribus Unitis' capsizing and going down around dawn. Several hundred men died including the new Captain. 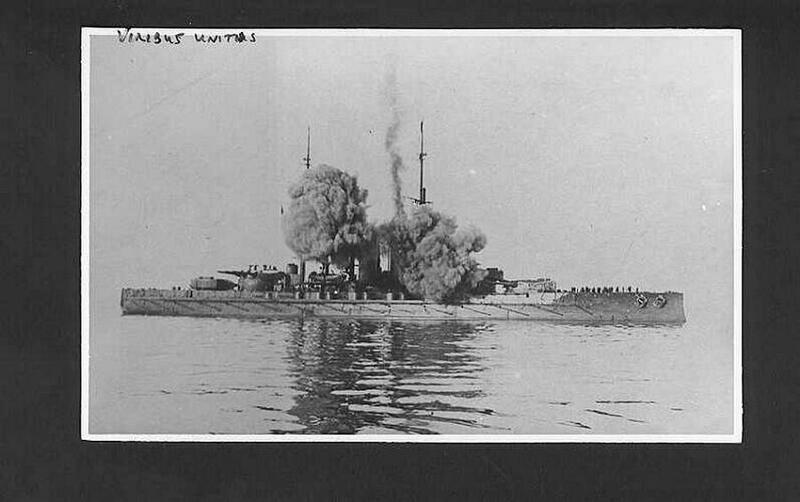 SZENT ISTVAN (King Stephen 1 of Hungary), 10th June 1918, northern Adriatic Sea, south east of Pola (Pula), nine miles southwest of Premuda island (c 44-15’N, 14-30’E) - 2 torpedoes from Italian motor boat 'Mas.15'. Leaving Pola on the 9th, she and the three other 'Tegetthof' dreadnoughts of the 1st Battle Division, First Battle Squadron sailed to support a planned cruiser raid on the Otranto Barrage, now believed by the Germans to be a serious obstacle to U-boat movements. Two Italian anti-submarine motor boats - 'Mas.15' and 'Mas.21', both 16 tons and armed with two-45cm torpedoes, happened to be out in the northern Adriatic, towed there for a minesweeping mission. 'Mas.15' (Cdr Luigi Rizzo, who sank the coast defence ship 'Wien' in December 1917 - below) hit the 'Szent Istvan' amidships at 03.30hrs on the 10th. She rolled over and sank at 06.00hrs with 89 men lost. 'Mas.21' missed the 'Tegetthoff', but both Italian boats escaped and the Austrian operation against the Otranto Barrage was called off. 22. U.10 class coastal boats, U.10-U.11, U.15-U.17, 5 boats, 2 lost - 125/140t, 6/5 knots, 2-45cm tt, 17 crew, launched 1915. 23. U.14 - 400/550t, 12/9, 1-53.3cm tt/6-53.3cm external torpedoes/rearmed with 1-8.8cm, 28 crew, recommissioned 1915. 26. U.43 class coastal boats, U.43, U.47, 2 boats - 265/290t, 9/6 knots, 2-50cm tt/1-8.8cm gun, 22 crew, 1917. Note - My thanks to Danijel Zavratnik from Slovenia for noting that most of the place names are Italian spellings and that many have changed since World War 1.